Congratulations on becoming a GO Team Member! We are so glad that you’ve decided to trust God and participate on a GO Team this year. We believe that being a part of a GO Team is a step in discipleship and trust that God is going to use this time before, during and after your trip to draw you closer to His heart for the world. This page is full of helpful information as you prepare for your GO Team. You will see links below to access Managed Missions & Ministry Platform to help you prepare and track your financial support. Please take time to read through the Frequently Asked Questions, and check out the Tutorial Videos for Managed Missions & Ministry Platform. If you have a question that is not answered here, please contact your Team Leader or email Carolyn Kixmiller, the Global Engagement Coordinator, at ckixmiller@compassionchristian.com. Utilize this online software to manage all the logistics of your trip, track team meetings & submit important documents etc. Note: you can track your financial support progress on Managed Missions, but this is only updated weekly – for real time information, use Ministry Platform. Utilize this online software to make contributions to your trip and track any financial support given by others to your trip. Include this form when communicating with your support team. Find out how to utilize Managed Missions to view your Team Formation schedule, upcoming tasks, submit GO Team forms and create a profile to share with your friends & family. Find out how to utilize Ministry Platform to track your fund raising progress, pay your deposit or make payments for your trip, or share your support goal with friends & family. 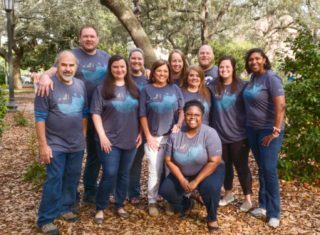 Why does Compassion Christian Church place such a high emphasis on involving members in Global Outreach Teams? learning to discern if God is calling you into cross-cultural service. Our goal is not just to get people “involved” or to have “programs” but rather to make lifelong, mature disciples of Jesus with a heart for the world. In summary, this means learning to trust God in all things. Why does Compassion Christian use a support-raising model for going on short term trips? One of the stated goals of GO teams is to discern whether or not an individual is called to cross-cultural missions work. The methodology Compassion Christian uses for preparing teams for a short trip imitates the one most full-time missionaries use. There are distinct phases of the process: hearing God’s call, building a support team, preparing one’s heart and mind for the task, and then going. We believe building a prayer/financial support team is a critical element to this process. Even if you are in a situation of being able to pay for your entire trip, building your prayer support team is critical. Why do you ask for a copy of my support letter to potential supporters? Asking to see your support letter allows us an opportunity to help you improve or correct the content of your letter. It also helps us to better determine your willingness to do the minimum required to (1) build a support team in a timely manner and (2) follow the guidelines established in the GO Team Preparation Manual. Lastly, it enables us to ensure that you maintain the integrity of your request. We have had situations where team members ask people to send funds directly to them while using the name of Compassion Christian, in which case the church can provide no accountability. We want to ensure a transparent request, as support is processed through us, so we ask that you show us how you requested support. We also take your investment in the support building process into consideration should you require financial assistance. You may choose to send an email or use social media to share information about your trip. This is fine, simply submit a copy of your message, whatever medium you choose. How do I write a support letter or email? Letters should be sincere, focused, and sent to people with whom you have a personal relationship. Include specifics (including deadlines) about your team’s goals and your personal faith goals. Lastly, remember that sincerity and conviction resonates with supporters. They want to read your voice, not a standard form letter. There are guidelines for support letter writing as well as sample letters included in your GO Team Prep Manual (link at the top of this page). Why am I required to contribute a minimum of 10% of my own money? We ask that you make a commitment to do the same thing you are asking others to do on your behalf. Mission trips are not an opportunity for you to go on an all expense paid experience. Raising support is meant to supplement what you are able to invest on your own and to give you an opportunity to include others in what God is doing and will do through your Team. That said, trips are a significant financial commitment. 10% may be a relatively small portion of the overall cost of a trip, but it’s meant to be a baseline for your investment in your own trip. The point is not the amount, but rather that you give sacrificially for this effort. If 10% of the trip cost isn’t available to you, a longer preparation time may be necessary. On the other hand, if 10% is not a sacrificial effort, you may consider giving more or contributing to other members of your team in need of support. Yes. While tax laws are constantly changing, the key factors in a gift being tax deductible include: the contribution must be made payable to Compassion Christian Church (a registered non-profit); and the giver must understand that he/she relinquishes control of the gift once it is made (per IRS regulations this includes personal funds). In other words, once received, the gift cannot be refunded or directed to another designation. That being said, we always encourage people to seek professional advice as it pertains to tax consequences. Is it possible to receive a scholarship if I am unable to raise the full cost of the trip? Obviously our goal is to have as many Compassion Christians as possible experience the blessing of serving on a GO Team. There are several factors in determining whether a person should receive assistance with the funding of their trip. These factors include: the financial status of the team overall, the willingness of the individual to do what is asked of them (make every effort to raise support by sending letters, saving & contributing their own resources), and submit to the process of preparation – namely attend the team formations and work to be as prepared as possible for the upcoming experience. Only active Compassion Christian members will be considered for assistance. Anyone who receives financial assistance for a trip is required to be fully funded the following year should they choose to participate again. In anticipation of this, there may be a longer time of preparation required based on circumstances. However, we are willing to evaluate each situation individually. If I contribute my own money to meet the deadline, what happens if additional contributions come in for me? Can I get my own money back? You are a giver to your own trip. As such, you also must understand that you relinquish control of your gift once it is made, per IRS regulations. We will not refund additional support that may come in. If supplemental funding does come in, it will first go to any other team member’s financial shortfalls, then to offset the cost of leaders and pastors and any unforeseen expenses. Can I designate surplus support from my account to others on the team? No. A fundamental truth is that you can’t ask God to provide in a time of need, and then want to personally control any extra He has provided. Extra funding will always first go to help another team member who hasn’t raised their full support; then, if the team is fully funded it will be used to offset the cost of the leader/pastor. Finally, it will help cover the shortfall of another Compassion Christian team. It will not go into the general missions account. The only exception would be for immediate family members raising support together. For instance, if you and your spouse are participating on a team together and one of you has received more support than necessary and the other has an unmet balance, the spouse still in need of support’s goal would be adjusted to reflect the other’s support. Will I have an airline ticket purchased for me as long as I have enough in my account to cover the ticket? No. If your trip is not fully funded (and no other arrangement has been made involving the team leader and the Global Outreach Pastor), then you will not have an airline ticket purchased. Unfortunately, this policy is non-negotiable. We send you as part of a team, and there are many factors to consider when it comes to arranging travel for teams, especially when it comes to booking flights together. The expectation of all team members is that full support will be raised by the final deadline, not just the airfare costs. It is your responsibility as a team member to raise all the necessary funds. Buying airfare for partially funded members jeopardizes the welfare of the entire team, as it still leaves necessary purchases/costs to incur yet to be funded. The welfare of the entire team cannot be sacrificed in good faith for the individual who is not prepared for the trip. Can I arrive earlier than or depart after the rest of my team on a trip? For the safety of the team and in consideration of our Partners, outside of extreme circumstances, we ask that all team members travel to and from the host destination together. Can I use frequent flyer miles to cover my airfare? Great question, but no. Save them for another opportunity. To ensure consistency for team bookings, Global Outreach will arrange all flight bookings. You will, however, be the direct recipient of any frequent flier miles that you may accrue on any flights booked for you. What if I am not able to go on the trip for any reason? If you need to withdraw from a team, your funding will be placed in a restricted account (minus the initial non-refundable deposit and any funds already utilized) and be available for your use on a future trip within the next 12 months. If tickets have already been purchased or if funds have already been transferred to our Partner, you may not be able to recover your full support. If an airline credit is received because of an unused ticket it should first be applied, if possible, to a GO Team in the next 12 months. If this is not possible, you may use this credit for personal use, however, it is imperative that you communicate your change in plans to your entire support team. Is it acceptable for my team to do fund raisers? Compassion Christian Church does not sanction fund raisers outside of the general giving to the church. However, an individual or team may develop creative ideas to raise the necessary finances for their trip as long as our Christ-like witness to our community is not adversely affected. Please reference your GO Team Prep Manual for more information and Guidelines regarding support raising. What is the one thing that causes most people to miss out on the blessing of a mission trip experience? During the preparation process, the answer is simple: procrastination. Delay in asking questions, delay in making a decision to go, delay in sending out support letters, delay in beginning daily prayer for the Lord to bless your faithfulness, delay, delay, delay. The Enemy is never threatened by someone who will neutralize themselves by putting off important decisions. On the field, team members miss out on blessing (or cause other people to miss blessings) by being inflexible or proud. You are responsible for positioning yourself to receive the blessings that come from being flexible and humble.